It looks like a couple of additional features slipped in with this update. Here's the official changelog from the Play Store, posted just a couple of hours ago. YouTube Kids now supports 360° videos! From under the sea to the surface of Mars, explore the world and more in an immersive 360° experience. In the middle of a video, but need to do something else? You can now pick up right where you left off with the new Resume Playback feature. The main YouTube app started supporting 360-degree videos almost a year ago. Since then, the sibling apps have been following suit. Now it's time for YouTube Kids to join the pack. It's a little surprising that it came so late since Google's push for Cardboard has been heavily directed at kids, but the recent transition to YouTube Red and closer integration with Play Music have probably taken priority. Support for resuming playback is a much bigger improvement. If a call comes in or something urgent comes up, parents will have to pluck their phones out of the hands of their children. But kids are just like adults in that they don't want to restart their shows from the beginning–at least not until they've finished them, then they'll totally restart 2-3 times. Now a video can be resumed from where it was interrupted, so the 5 minutes of repeated content won't have to put your kid's 2-minute attention span to the test. The only notable change you're going to see is buried in the Settings screen, but it's definitely worth looking at. 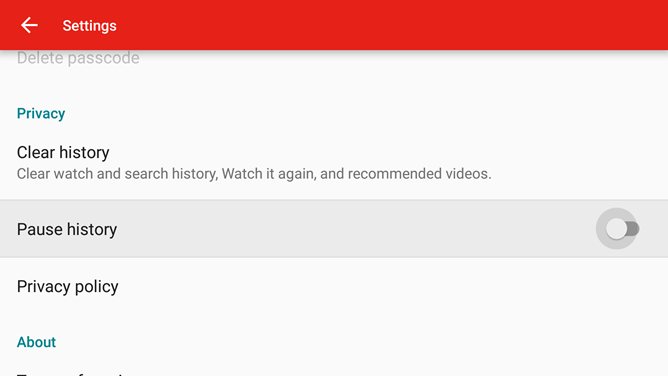 YouTube Kids is joining the rest of the family by offering a toggle to pause watch history. This is a pretty great addition since it will allow parents to toggle history off and hand their phones to a kid for a little bit of video time without flooding their history with videos for children. It's important to note that this setting is not shared across the rest of YouTube's clan–watch history can be disabled in just the Kids app and it won't affect any other YouTube apps. That means you can leave the setting on permanently and still continue to record your own history. Unfortunately, the setting doesn't appear to sync across multiple devices, like from your phone to your tablet, so you'll want to configure it appropriately on any gadgets the kids will be using. Like all preferences in the YouTube Kids app, this is only accessible by going through the captcha-like lock that is meant to keep kids from messing around with the options. If you've ever taken a long trip with kids, you probably have some sense of how great it can be to set them up with a distraction for a couple of minutes (or hours). While you're at home, it's pretty easy to plug the little ones into YouTube Kids for a little while and let them binge. However, you might not have convenient access to Wi-Fi at your destination, and almost certainly not along the way, so the GBs on your data plan are sure to pile up quickly if your kids are in the middle of a YouTube bender. YouTube Red allows users to store videos offline for playback in the future, but if you didn't notice, YouTube Kids doesn't offer this feature. The good news is that subscribers should soon have the option to enjoy this and the rest of the features available to Red subscribers. That includes saving videos for offline use, background audio playback, and probably ad-free viewing. Actually, the ad-free viewing isn't mentioned in the strings, but it definitely should be included. YouTube Kids still shows ads to Red subscribers, but there's (definitely) no reason that that should continue after full support for the subscription features is added. It's still not clear how the interface will change to support downloading of videos, but that's surely an important consideration since kids probably shouldn't be able to fill up your device storage by tapping a button.